Professor Andrew Hector is Professor of Inorganic Chemistry within the Electrochemistry Group at the University of Southampton. Andrew Hector obtained a BSc in Chemistry from Imperial College, London and a PhD in Ivan Parkin’s group at University College London. He came to Southampton in 1995 to work as a postdoctoral research fellow first in complex fluorides and oxyfluorides, then in lithium battery cathode materials. In 2000 he took up a Royal Society University Research Fellowship to study precursor routes to new metal nitride compositions. He was appointed to a lectureship in 2008, then promoted to senior lecturer in 2011 and a chair in 2015. Andrew is a member of the Electrochemistry research grouping. Externally he is a member of the Royal Society of Chemistry, the International Society of Electrochemistry and the American Chemical Society. 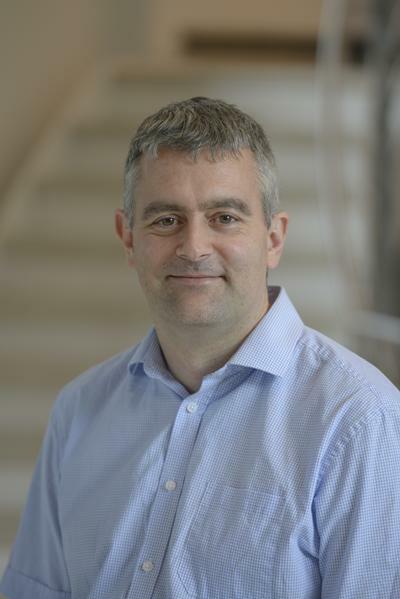 He currently serves on the RSC Electrochemistry interest group committee and the EPSRC College and serves on the Royal Society Research Grants panel. Materials synthesis, including metal nitrides, thin film materials, sol-gel and solvothermal processes and porous structures. Materials characterisation – powder and thin film diffraction, including in situ studies and texture and stress measurements, supplemented by a suite of microscopy and spectroscopy techniques. Electrochemistry, including charge storage in battery and supercapacitor type cells, and electrodeposition of various materials. We have a long-standing interest in metal nitrides, specifically the development of sol-gel and solvothermal chemistry to produce them in new forms. Metal nitrides are much less well explored than metal oxides, as oxides occur so prominently in nature in an oxygen rich atmosphere such as that on earth. However, nitrides have a number of important technological applications and are of interest for a diverse range of potential new applications – we are currently working on applications in charge storage and catalysis. Our electrochemistry activities include the deposition of transition metals and main group elements, electrochemically assisted deposition of aligned mesoporous films and the assessment of charge storage materials, including a significant activity in the application of metal nitrides as redox supercapacitor electrodes and conversion materials in sodium and lithium batteries. Thorough characterisation is essential to the understanding of materials. We are extensive users of the excellent powder and thin film diffraction facilities in Southampton and also carry out diffraction studies at synchrotron X-ray (Diamond Light Source) and neutron (ISIS and ILL) central facilities. We also use electron microscopy to examine microstructure and nanostructure, EDX, WDX and XPS to examine compositions, X-ray absorption spectroscopy for local structure and oxidation state information, and electrochemical techniques such as cyclic voltammetry to test pore accessibility and impedance spectroscopy to examine interfaces. Chirico, P., & Hector, A. L. (2010). Solvothermal synthesis of gallium and indium nitrides using lithium amide. Zeitschrift fuer Naturforschung B, 65b(8), 1051-1057. Hector, A. L. (2007). Materials synthesis using oxide free sol-gel systems. Chemical Society Reviews, 36(11), 1745-1753. Jackson, A. W., Hector, A. L., Li, J. (Ed. ), Brese, N. E. (Ed. ), Kanatzidis, M. G. (Ed. ), & Jansen, M. (Ed.) (2005). A molecular route to dip-coated transition metal nitride thin films. Materials Research Society Symposium Proceedings, 848 (Solid stat, FF2.2. Hector, A. L., Jackson, A. W., McMillan, P. F., Shebanova, O., Li, J. (Ed. ), Brese, N. E. (Ed. ), ... Jansen, M. (Ed.) (2005). Amorphous "Ti3N4" and formation of nanocrystalline TiN. Materials Research Society Symposium Proceedings, 848. Henderson, S. J., Hector, A. L., & Weller, M. T. (2005). High throughput synthesis of pigments by solution deposition. Materials Research Society, 848, FF3.17. Hector, A. L. (2005). Magnetic structure of K2NiF4-type iron(III) oxide halides. In J. Li, N. E. Brese, M. G. Kanatzidis, & M. Jansen (Eds. ), Solid-State Chemistry of Inorganic Materials (pp. FF3.18). (Materials Research Society Symposium Proceedings; Vol. V, No. 848). Warrendale, PA, USA: MRS. In year 2 Andrew teaches materials chemistry, specifically that of metal oxides and silicates, in CHEM2016 “Intermediate inorganic chemistry II”. He is involved in support teaching (workshops, tutorials and laboratory demonstrating) across years 1 and 2. In part 4 Andrew teaches diffraction applications to materials in CHEM6146 “Main Group Chemistry and Crystallography”. For postgraduates he teaches crystallography in CHEM6153 “X-Ray Diffraction as a Characterisation Method”, coordinates CHEM6141/8040 “Advanced Topics in Inorganic Chemistry” and teaches battery characterisation in CHEM6152 “Battery Materials and Characterisation”. Andrew was head of inorganic teaching from 2008-2014. He received the Vice Chancellor’s Teaching Award in 2007 and is a Fellow of the Higher Education Academy. He served as an external examiner for the MSc “Chemistry by Research” programme at UCL from 2013-16. He served as Director of Programmes in 2017-18 and is currently Deputy Head of School Education.